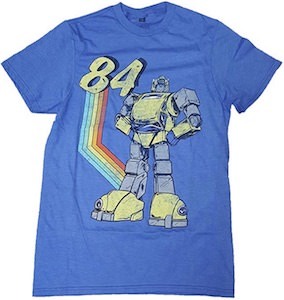 If you want to show the world that you like the Transformers then check out this 1984 Bumblebee T-Shirt. 1984 was the year that the Transformers animated series came out and this t-shirt is all about that. On the blue shirt you can see colored stripes in the background that all start at the number 84 and then in front of that you can find Bumblebee in his robot state. You can get this Bumblebee t-shirt in men’s sizes Small – 3XL and they are all made from 50% cotton and 50% polyester. So now you can show the world around you that you know about the classic animated series and not just the current Transformers movies. 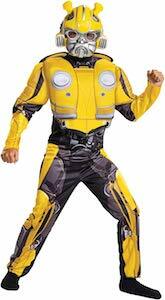 This Halloween your child can become a Transformer because this is the kids Bumblebee costume. The kids Transformers costume comes in kids sizes 4 – 12 and includes everything you need besides some shoes. There is a nice jumpsuit with chest plate and to make you into a true Transformers there is nice mask too. Besides being a true Halloween costume it is also perfect to wear when you go see the Transformers Bumblebee movie or just want to play dress up at home. Now all the kids can become a true Bumblebee Transformer all thanks to one amazing Halloween costume. Do you love Transformers, especially the Autobots? Then this will be a great addition to your Transformers collection and wardrobe. A very nice looking shirt that features three Transformer characters, Optimus Prime, BumbleBee and Grimlock on the front along with the official Transfomers logo which is “TRANSFORMERS” and the Autobot logo. This really unique and cool sweater is a women’s raglan style black body with white sleeves, it is made from 100% cotton so it will be very comfortable and super durable. It is available in a wide variety of sizes from XSmall – 3XL. 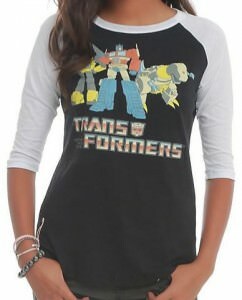 Support your favorite Transformers with the Transformers Girls Raglan Sweater. No more bagged lunch for you because now there is an Transformers lunch box. This metal lunch box has embossed graphics and it’s Autbot all the way. Yes the lunch box has the Autobot logo on it and then there are many Autobot transformers on the front and the back and yes of course that includes Optimus Prime and Bumblebee. A lunch box like this is great to put your lunch in and take it to school or work but is you don’t want to worry about damaging it then you could of course use this Transformers lunch box to store other things in like maybe Transformers memorabilia. 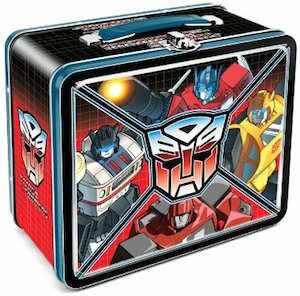 Now would be a great time to check out this Transformers Autobot Lunch Box. This Bumblebee figurine is based on the Transformers movie Age of Extinction. A figurine like this is just fun to have staring at you from your desk of book shelve. Bumblebee is 3 3/4 inch tall and is part of the famous Funko Pop! Vinyl series witch is great to collect. And this time Bumblebee will not transform he will just be his amazing self. And this figurine comes in a nice display box so that you can keep him in new condition if you wish and still you can admire it through the window in the box. 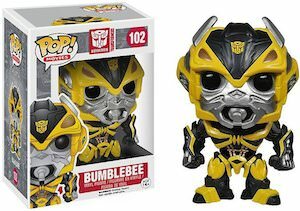 Transformers fans should check out this Transformers Bumblebee Pop Vinyl Figurine. If you have a Transformers birthday party then you will need some amazing napkins to clean all those dirty hands and faces. But we got you covered with some amazing Transformers Bumblebee napkins. These paper napkins comes in packs of 16 and that of course is plenty to wipe away some cake and snack leftovers. And with a big yellow Autobot Transformer on the napkins the kids will be more then happy to use them. Party decorating all starts at the napkins and that is covered with this amazing design. Yes that is Bumblebee on the t-shirt. So if you like to wear Bumblebee on your chest then this could be the perfect Transformers t-shirt for you. The t-shirt comes in a wide range of styles for men, women and children. And that is not all it has fun colors and sizes so that you can choose the one that you really love. 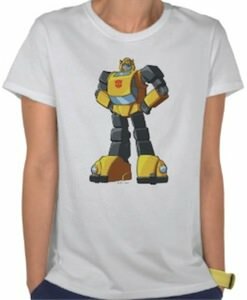 So get ready to wear a Transformers shirt by checking this Transformers Bumblebee T-Shirt. Keep your beverage at the perfect temperature with this FUNtainer bottle. Featuring Optimus Prime and BumbleBee from the cool television and movie series Transformers, a very well detailed picture of each can be found on opposite sides of the FUNtainer with awsome vibrant colors. A very durable stainless steel interior and exterior also features a push-button lid with pop-up straw, also a double-wall vacuum insulation helps to keep your favorite liquids hot or cold. 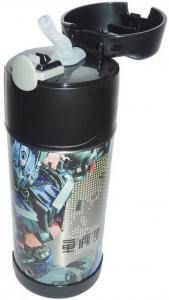 Check out the Transformers Optimus Prime & Bumblebee Funtainer Bottle. Does your kid loves Transformers or are you looking for the perfect party favor for a boys birthday party? Look no further as this Transformers Coloring and Activity book is the solution. This coloring book has 144 pages of Tranfsormers fun with fun coloring and activities. And this coloringbook comes with crayons and includes stickers so the kids can start right away without having to hunt down other supplies. 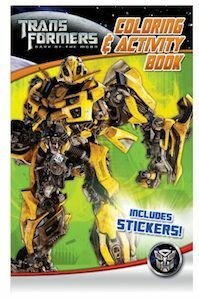 The kids are gone love this Transformers coloring and activity book and it start when they see the big Bumblebee Transformer on the front. Get ready to keep the kids busy with this Transformers Coloring And Activity Book. Protect you precious iPhone 4 and 4S with some serious attitude. 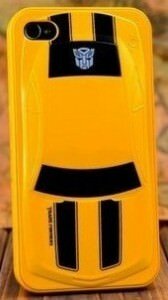 This is a hard case that features Bumblebee from the popular Transformers movies and television shows. Made from alloy this 3D version looks like the real Bumblebee while still in his car form. With the awsome yellow color of Bumblebee and black stripes you will also find in the rear window an Autobots logo. Leaving all ports and buttons open for use this is the perfect case for the Transformers fan. 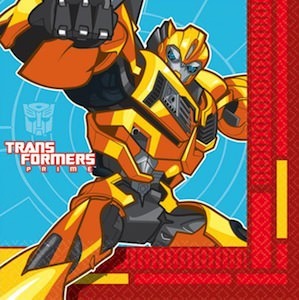 Get your Transformers Bumblebee iPhone 4 4S Case.